Sara Naim is an artist. The Third Line is pleased to present Building Blocks, Sara Naim’s second solo exhibition at the gallery. Extending the artist’s preoccupation with micro images and dichotomies between proximity and distance into an examination of memory and cognitive associations, Building Blocks maps the cellular make up of three elements nostalgic to the artist: jasmine, soil and Aleppo soap. Triggers of olfactory memories sourced from Sara’s native Syria, the protagonists of her latest body of work awaken thoughts of things and places she associates with the realm of the familiar, yet also perceives as foreign. 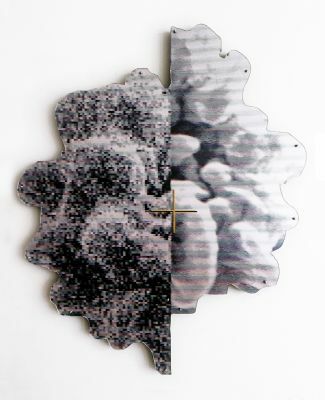 Using a Scanning Electron Microscope, Sara captures the cellular structure of each sample, magnifies it, and reveals its complexity through imagery mounted on wood and plexiglass. The large-scale renditions include deliberate glitches such as formal distortions, light leaks or reticle cross-lines—interferences that further abstract the works and hint at the imperfection of memory and thus of human nature. coming closer is here synonymous with grasping less. Conversely, one of the elements magnified in the Forms series, the Aleppo soap, morphs from micro to macro, as soap brick structures are erected on the gallery’s floor. In part broken, cut and fragmented, the towers’ intentional defaults imitate glitches witnessed on Sara’s photographs. Their carefully orchestrated arrangement, on the other hand, performs a cellular analogy to the building blocks of life and further intimates the vastness of the microscopic universe extant within us.